For whatever reason this lake has my number, but I do feel relieved that lots of teams struggled at this tournament. I am still yet to travel to the North end of the lake and fish. This was where we originally were headed and so was everyone else! That was until I saw a point that peaked my interest and so we broke off from the pack and tried the point. I am not a crowd follower! We had one short fish blow up on a frog and Dustin had a decent hit on a Texas rigged worm but no fish. So instead of following everyone else I decided we should head back towards the island. There is lots of deep water with trees and I’ve never truly figured out how to fish trees in 40 feet of water especially when it’s 40 feet of water 5 feet from the bank. I know the fish are there. I was flipping trees and trying to let my jig drop the whole way down but I’m not very patient and so I started just swimming my jig about 5 feet down and BAM! A 15″ bass hammered me! But one fish is luck so we were looking for a 2nd fish to make a pattern and wouldn’t you know… not 2 mins later doing the same thing I caught our biggest bass of the day a 3.5lber that was tagged by ISU! (more later) Now we are on to something right? Nope… as we continued up the creek arm, the duckweed and cheese mats were just too much of a draw and out comes the frog. From 9:30am to about 10:30am if you threw a frog close to a bass he would BLOW out of the water and reveal himself. On top of that he would blow up 3-4 times before finally getting hooked up. So much fun but we only managed one more keeper this way and several short fish. Unfortunately, the keeper we did catch on the frog somehow hooked itself on the bottom of the throat and was bleeding pretty bad! We cleaned the livewell water and added my favorite G-Juice additive and the fish seemed to be alright but was not great. This is the tough part because you have to decide… throw him back while they are still alive or keep em and hope they don’t die and give you a 1lb penalty. We made the decision the way the bite seemed to be going that we would keep it in hopes that we could catch 3 more fish to cull him out. Bugger made it till 1:30pm before finally expiring and we were unable to add another fish anyway so culling was out. Oh Well. Tagged Bass Info: Bass #6531 was caught first in May on a Sunday tourney and weighted 3.9lbs. She weighed only 3.5lbs the day I caught her. Length was virtually the same at 19″ to 19.25″. Sounds like next year will conclude ISU’s study. I try to at least learn one new thing at each of these tournaments, and I think the take away from this one is that I need to switch to a spinning rod and wacky worm more… sounded like this was a good tactic to pick up a couple of fish in the trees. I also, need to take the time to fish the North end as there has to be something that causes everyone to go there first thing! A highlight of the trip was a GIANT Musky that followed my jig all the way back to the boat and as my heart jumped out of my chest trying to decided if I wanted to hook him or not he slowly sank away solving my dilemma. But what a gorgeous fish! But even though the result wasn’t as good as we had hoped catching up with Dustin the night before breaking in his new camper was a such a blast! I do always enjoy our time together especially on the water! 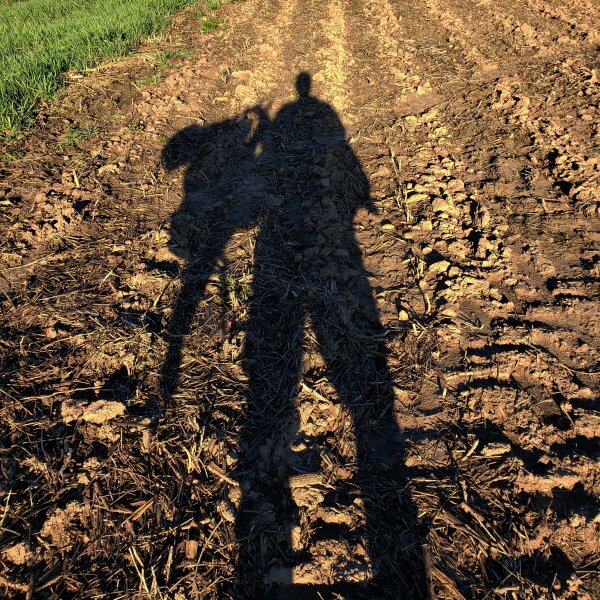 Oh well… there is always NEXT YEAR and now to concentrate on Deer!!! Brushy Creek FRUSTRATES me to no end!!! I have said that before and will almost always say it again in the next year or two. However, I am excited about our finish this weekend. Sure it was 8th… Sure it was out of the money but if you break it down here is why I am excited. First off I haven’t fished that lake at all this year and I may not have even fished it last year. Secondly, it was a tough day. There were seven teams that didn’t weigh a fish. Now, I do know that some guys wont weigh fish when they know they aren’t going to win but still there were eight teams that DID weigh fish that we beat. Should we have done better? You bet! Brad had a keeper hooked that, for whatever reason, came unbutton as she tried to jump. Wasn’t even a full jump too. When I saw it shake it’s head, it sure looked like it had both trebles of his crankbait in her mouth good. But stuff happens. I know that fish would have been easily 2 lbs and more than likely 3 lbs. That would have jumped us up to 6th. But add that and a fish that I know was a keeper, that completely missed my frog to our bag and things change. This fish jumped completely out of the water, so I got a good look at it. Add another conservative 2 lbs and now we are in 4th if not 3rd place if it weighed more. Maybe I’m trying to make myself feel like we did better than we did or that there was a chance but I do feel we were close and as always left feeling encouraged. 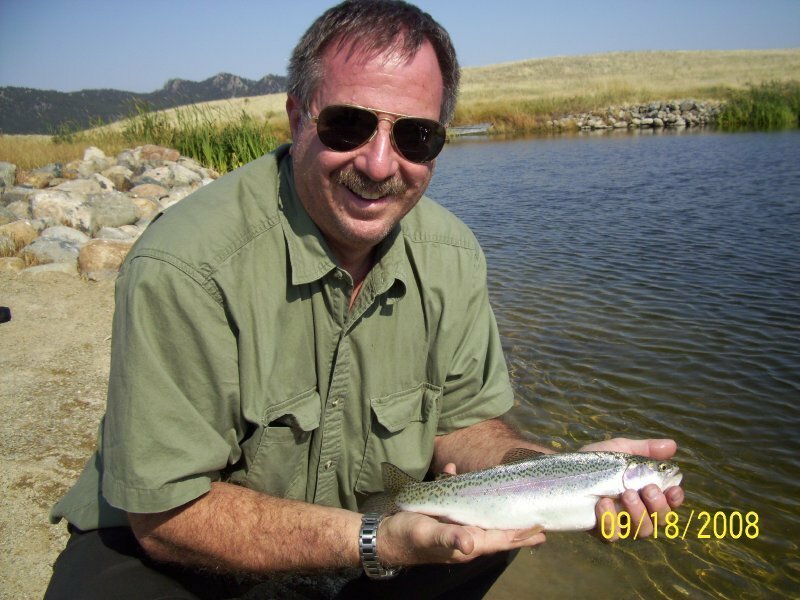 I can tell you that the pattern that we had success with was a top water frog. A white Spro Bronzeye (favorite frog period). All the fish we caught seemed to be on little cheese patches. You had to get your frog on the shore or right on the edge and then work it out and the fish ALWAYS would hit in the last 3rd of that cheese mat. A few really small ones in an actual grass mats but the cheese was the deal and it seemed these mats next to channel swings were the best. Again we maybe could have done better if we could find more areas like this but we had this pattern clearly to ourselves. The coolest part of this tournament was catching a tagged Bass. Andrea Sylvia of Iowa State’s Department of Natural Resource Ecology & Management, who was onsite tagging new bass, was very nice and emailed the details of my tagged bass, Bass #4898. It was initially tagged on 6/25/17 and was 15.6″ and 2.2lbs. This was its first recorded recapture on 9/24/17 and he was 16.1″ and 2.35lbs. Pretty cool to learn the growth in that short of time and I’m anxious to see more info from their study. Alright enough of that… Fishing is over and its time to hunt!! Bring on the Wyoming Antelope and then back for our Iowa Whitetails!!! The challenge is back and this year we have a few changes. Last year I broke 2000″ which means one of two things. The Challenge was too easy or it was just one of those years. It has been awhile since I’ve posted anything new so figured it was time to do so. So what has AMO been up to? Well my buck has been officially scored and was officially accepted into Pope & Young at 156 6/8ths. Just need to make a mount for him and rearrange the wall of fame in the basement. I have also applied to become a Pope & Young Official measurer and am awaiting sponsor letters of recommendation and will keep you posted on that as well. With all this going on we jumped into ice fishing. We have had great ice for quite a bit of the winter now and unfortunately we haven’t taken quite as much advantage fishing as we should have. We have really only hit the pond but boy has the pond really bounced back from the winter kill! We did however take full advantage of the ice on the pond and have built 2 new docks on the pond and replenished multiple brush piles and drove 9 trees into the water like posts! If these posts stay standing and the water returns to normal pool then they should make for fantastic crappie structure in the Spring! We did get a fairly decent gathering for an afternoon at Hickory on the ice and only Mike Olson and Dustin Eighmy caught more than one fish. We decided to bail and took everyone to the pond were the fish were eager to eat! That pretty much saved the day for everyone. That is about it. Next month my 2nd child should be born and then turkey season starts up in April. 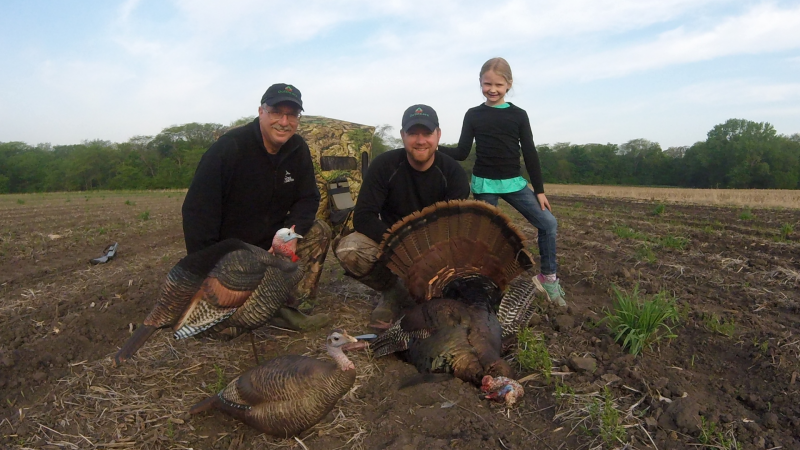 I have heard a rumor that the Meimanns will be visiting from Idaho and there maybe a morning turkey hunt and hopefully some fishing in the future with one of the original founders! Pretty exciting and stay tuned for those outtings! With the other night being the official end of WNF for the 2012 season it brings an unofficial close to the fishing season too for us. It’s sad to see this summer end! It was filled with highs and lows. 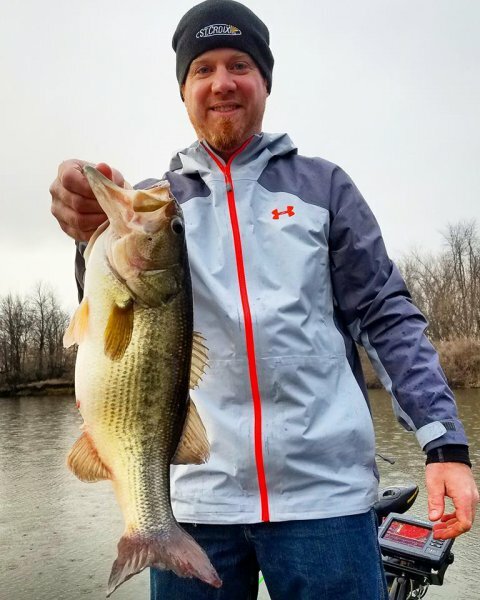 We came very close to winning the HGP Spring fishing tournament when Brad landed his biggest bass of the year at 19.25 inches. She was a pig and we thought we had it in the bag. But that length wouldn’t hold up. The rest of the spring was lots of fun with quite a few bass caught by everyone. Unfortunately, that came to a screeching halt as an electrical short in our trolling motor caused the boat to catch on fire and the front end burnt up. Almost the entire month of June was spent on the shore as we waited on the insurance company and the new boat to arrive. The biggest surprise was that in July I hit the 1000″ mark! Not only did we think this would be tough but almost impossible. What is even crazier is that as I write this, I passed the 2000″ mark on the last WNF of the year! 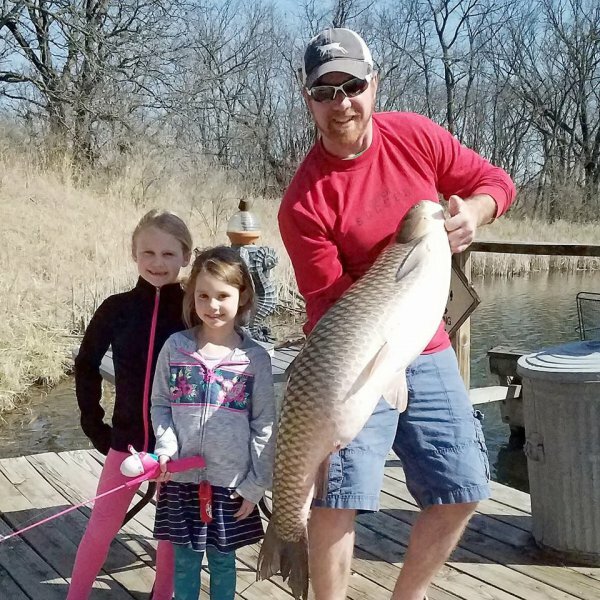 Never would I have thought that 2000″ was a number that was reachable atleast not in our local waters! So what does it all mean. I have no idea yet! I am still sifting thru the 7 months of data I collected. For instance, I learned that this year our Best chance of catching a fish 14″ or bigger was in May. We boated 27 total. May was also the month we caught the most inches with 1170.5″ boated between the 3 of us. 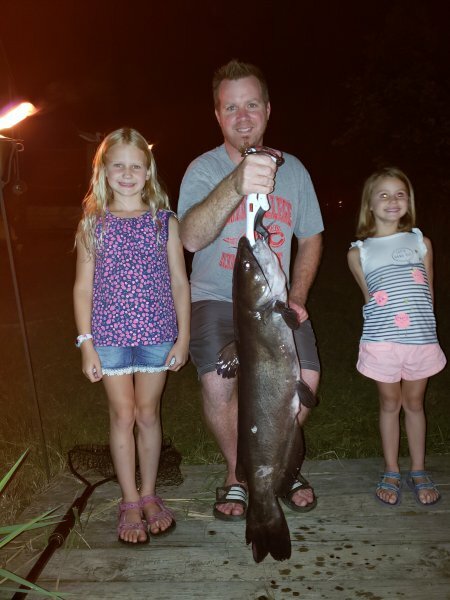 Our worst month for boating a fish 14″ or bigger was June with only 4. To add an astrisks to the month of June that was the month of the boat loss and we only fished once the entire month so that number maybe not be accruate. 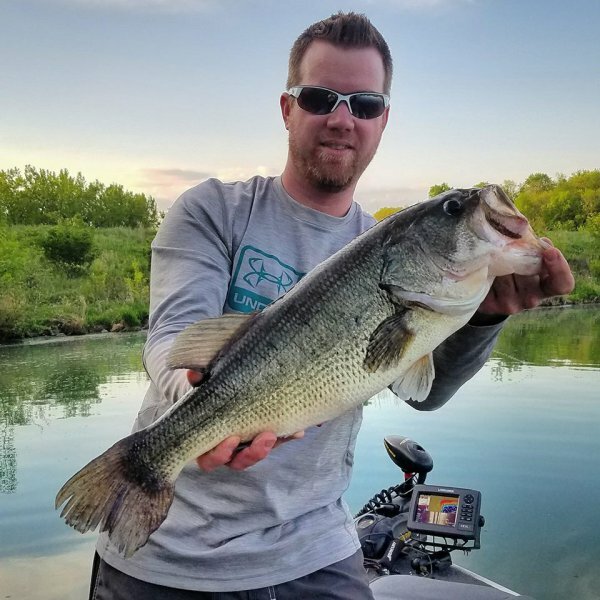 September was the next lowest this year with the number being 5 and probably should be deemed the worst month for us to catch a 14″ or bigger fish. I imagine as each year comes and goes these figures can and will change based on the weather. It will be neat to see this and really see if I can continue this kind of dedication to logging information. Only time will tell. One big advantage we now have with logging information is the new Lowrance HDS sonar. With its waypoint and trail mapping its been really neat to see our fishing trails and then to map each and every catch location along said trail. I believe this will be the greatest way for us to track and log a lot of this data here forward. I’m hopefully that I will get the boat out yet in Oct and hopefully find some fish. 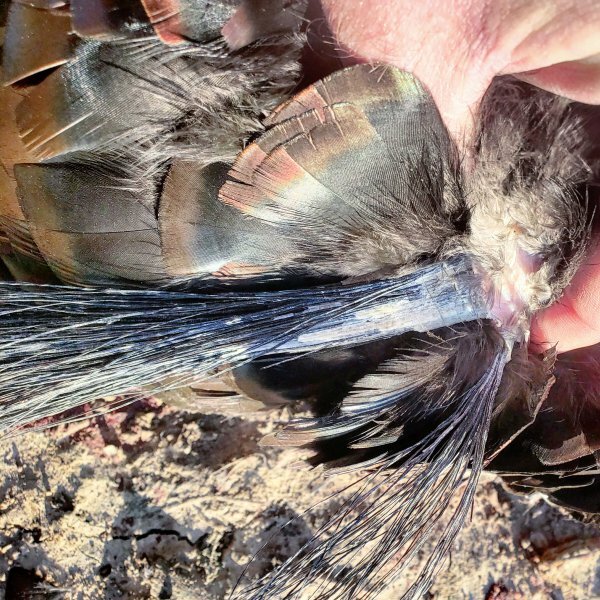 The only way that will happen is if deer season has a slow start. So, time to clean the reels and lower the drags and put them away for hopefully what turns into a great Deer season followed by some great ice fishing! Mike has thrown down the challenge to Bert and Brad. The challenge is the first one to measure 1000 inches of bass! First one to 1000″ will win the Golden Crappie Award! Keep checking back and watch as the race unfolds. Since it is so easy to make these graphs why not break this down by each month too! Well another HG tourney has come and gone. Common in the fall are cold fronts and boy did one blow thru Thursday/Friday. Along with that front came about an 1″ of cold rain, and then Friday night the high pressure moved in and cleared up the skies and brought the chilly temps. 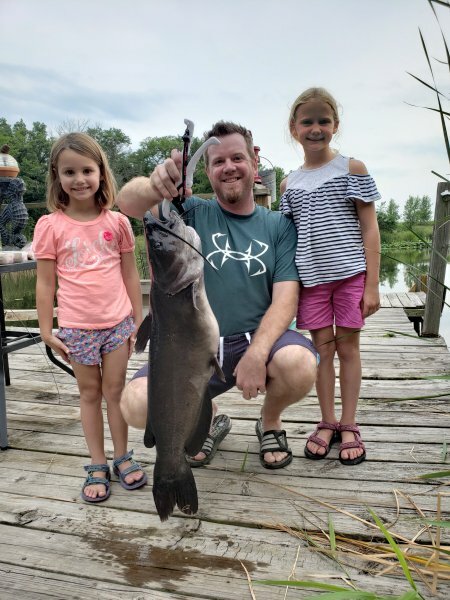 We had hoped that the East Side, being quite dirty, would still be one of the warmest spots on the lake and we could pick up one of the 17″+ fish that we had been catching during the last couple weeks. However, this wasn’t the case. The rain waters were still running in and had cooled the lake almost 8 degrees in the last couple days. This gave the fish over there lock-jaw. We were able to get two fish to blow up at the frog. (both fish missed the frog the first pass and then hit on the 2nd go round. They were a 13″ and 16″. With time slowly disappearing and no fish being picked up any other way, we abandoned the east side and headed down lake. At this point we knew the fish weren’t up on the bank like we had hoped and thus we started working the first and second depths. I tied on a KVD squarebill crankbait and started casting. We worked the South Shore and when we came across Blue Heron Point (I think that’s the name) we ran into a school! we picked up 9 of our overall 12 fish off this point and, unfortunately, as good as they were eating the KVD we couldn’t get the BIG bite we wanted. 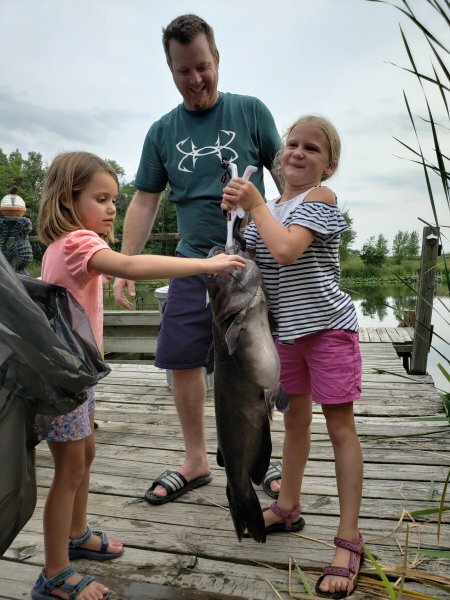 Seeing how all the fish were between 11 and 14″ and needing something over 17.5″ for the win we headed down to the dam to try our luck dragging worms and craws. This turned out to be the nail in our coffin! The West end of the Lake was just absolutely dead. (Very few measurements were even taken from this end of the lake was the rumor). Looking back at the tourney and how the weather was playing out this made absolutely a lot of sense. Bottom line is the wind. It played a huge impact on where I feel the fish were positioned and am just realizing that too late. 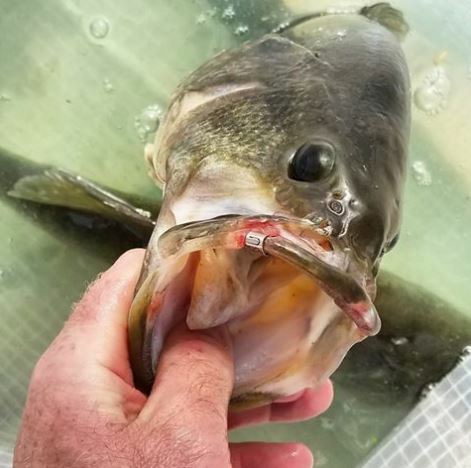 With the wind blowing up the lake like it was, it forced all the bait fish ( which were feeding on a giant trico hatch from the morning) up lake who were followingthe wind blown insect corpse and the bass were right behind bait fish. Now, what should we have done is stayed up lake. We should have circled back a couple more times and switch up lures. I’m sure now that the winning fish was in the school we found we just need to find the lure or the depth that it was at. So all in all it was good day on the water and hopefully it has paved the way for a lot more fish in the future with what I learned. 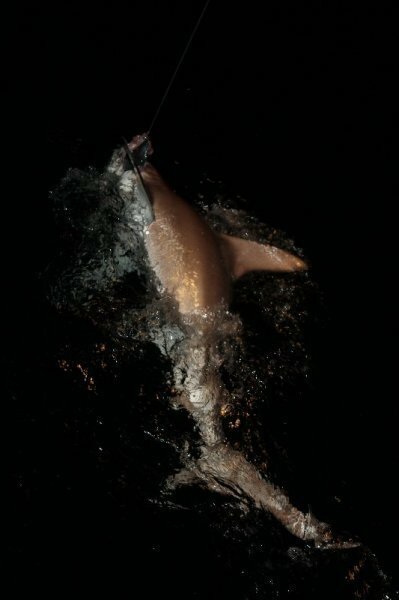 I have added over 40 images of Our Shark Fishing adventure! They are located at this link. To the Guy form Oregon I hope you remembered my website and find this link. I think the pictures of you and your shark turned out quite well! If you want full sized images shoot me your email and I will be happy to send them to you. Videos for both sharks caught are here. Well tomorrow is the tourney and if this morning was any indication of how tomorrow will be it is going to be COLD!!!! I dropped Katelyn off at DayCare and the temp at 7am was 38 degrees! That’s right. So, I suppose dressing in ice fishing clothing isn’t really a bad idea. My feeling though with the water temps being in the low 60’s the fish are going to be sluggish. I feel that the Dam or on the West side of the island might be the best places to start and craws and dropshots will be the starting baits and as the water warms up jerkbaits / crankbaits will come into the picture. So I guess we’ll see how things play out.